The best memoirs seem to spring from the fingers of writers who have an excess of something-or-rather in their lives. This excess begs to overflow the confines of their hearts and minds, and spills onto blank pages in the form of words that feel undeniably alive. Anne Lamott, in writing the transcendent Traveling Mercies, overflowed with rugged grace. Jeannette Walls, in writing The Glass Castle, overflowed with hard-won wit as she unraveled the tangled narratives of her family’s dysfunction. Jennifer Luitwieler, in writing The Accidental Runner and the Power of Poo, overflowed with unexpected determination as she took up running in an effort to train her dog to “doo” his business outside of her house. It may seem that we writers do what we do because we are too timid to live—that we prefer the comfort and safety of the written word to the living of life. But I would argue that we write because our cups tend to overflow. We are human bottles of champagne that have come uncorked, and we are exploding with life in every direction. 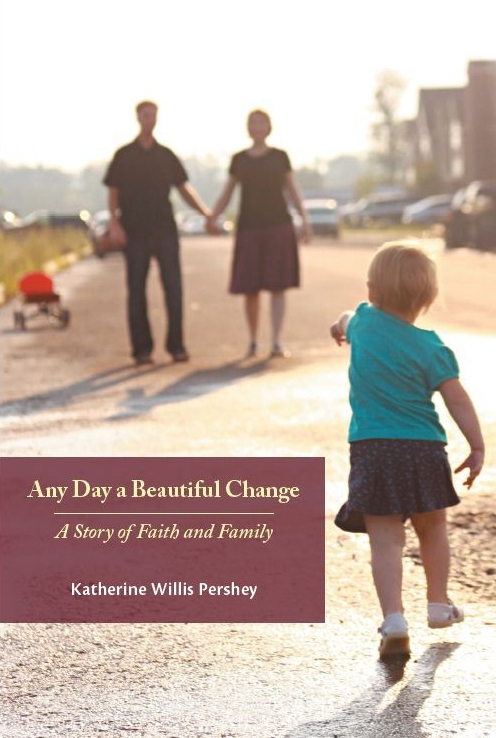 Katherine Willis Pershey‘s memoir, Any Day a Beautiful Change, released in March through Chalice Press, is the work of a writer who has an excess of meaning to glean from her own life as a wife, mother, and pastor. She uncorks her life in these pages, and does so in slow motion so we can savor the celebratory spray. Pershey’s prose is a mix of elegant and colloquial at the same time, and this approach keeps her pastoral musings earthy and intelligible for the layperson. Throughout the book, she proves herself to be a grounded pastor whose beliefs find traction in everyday life. She is not in the business of inflating theological hot-air balloons and floating away on abstract, academic voyages. She is a human being, and she is well-acquainted with her faults, but also with her triumphs. Above all, she is grateful for who she is and who she is becoming. Any Day a Beautiful Change takes its title from the Innocence Mission song, “Beautiful Change,” which is the fourth song on the band’s 2003 album, Befriended. My vinyl copy of this album is framed, and hangs in our guest room. Anyone who knows me at all knows that I esteem the Innocence Mission simply because Karen and Don Peris and Co. know how to wrest meaning and poetry from everyday existence with ease. Pershey’s book does the same thing, so its title is fitting. Sitting with this book for hours is akin to becoming acquainted with its author, her husband, and their daughter Juliette. It is intimate, modest in its approach, and serves helpings of humor and heartfelt realization to hungry readers in equal portions. Formally, it is comprised of a series of essays that offer the reader access to the author’s life both at home and in the pulpit. As she preaches while recovering from childbirth, as in the essay “The Hemorrhaging Woman,” it becomes apparent that the roles of mother, pastor, and wife overlap in unexpected ways. At times, her realizations are downright revelatory. In the chapter, “Sending the Love Inward,” she realizes that the difficulty she experiences in attempting to bond with her indwelling, unseen baby is not unlike the difficulty she experiences in attempting to develop intimacy with her indwelling, unseen Lord. This revelation is met, comically, with the response, “Oh my God. … No, not quite. More like: O my God!” There is a thin line between worship and blasphemy here, and it works well. Surely it sounds like blasphemy to some ears when we talk of our immortal God taking on corruptible human flesh. Another favorite passage of mine is a meditation on communion. As my church’s resident communion coordinator, I deal with an abundance of body and blood. I probably handle more carnage than Dexter, Showtime’s beloved serial killer of serial killers. In the process, I become completely desensitized to the meaning of the Lord’s Supper altogether. Long after I first wrestled with those doctrines in classrooms and chapels, I’ve finally learned that there’s no way for the bread to be broken and the wine to be spilled without someone’s body taking the hit. It isn’t that the pain is redemptive. It’s that the pain is redeemed. Take and eat, my daughter. This deluge of milk is called forth by you, and given for you. Like any good memoirist, she combs through the minutiae of her life, and finds the stories that make her who she is, and also the ways those stories relate to one another. Her pastoral life speaks to her life as a mother, and her life as a mother speaks to her life as a wife. It is as though she is her own trinity, and she is in constant communication with the different selves who comprise her being. My sole criticism is this: Any Day a Beautiful Change is too short. It is, according to my Kindle, roughly 130 pages. I wanted to keep reading. Thanks to her blog, I can. Katherine, her husband Ben, and their daughter Juliette all spring to life in full color there, reminding the reader that the “characters” who populate Any Day a Beautiful Change are quite real. There is an excess of life in Katherine Willis Pershey’s book, presumably because there is an excess of life in her life as well. I am thankful she was willing to uncork her life and christen the world with her story.